Pretty In Pink and Pink Passion (because I couldn't find my Regal Rose). I started out with white cs and just drug the Pretty In Pink pad across the service lightly and then heavily in different spots for a watery effect. 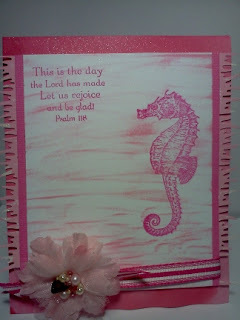 Then I stamped the Seahorse from Pink Paisley Nantucket set in Pink Passion. Then I found a piece of glittery dsp and punched with Martha Stewart's grass border punch for a seaweed look to my borders. Then I took an 11 x 4.125 piece of white and spritzed it with Chamgagne shimmer paint mixed with rubbing alcohol and Pretty in Pink re-inker and spritzed my card base. Love it! Added some two tone ribbon and a pink flower with the sentiment from Flourishes. Done & done! Dynamic Duo? I think sooo!! !